I wrote in 2010 that Keynesian economics is like the Freddy Krueger movies. It refuses to die despite powerful evidence that you don’t help an economy by increasing the burden of government. In 2014, I wrote the theory was based on “fairy dust.” And in 2015, I said Keynesianism was akin to a perpetual motion machine. What’s my proof? Well, during the period when Obama’s “stimulus” was in effect, unemployment got worse. And the best growth period under Obama was after the sequester, which Obama and others said was going to hurt the economy. When I discuss these issues with Keynesians, they reflexively claim that Obama would have gotten good results if only he had increased spending even faster (which is also their knee-jerk response when you point out that Keynesianism didn’t work for Hoover, didn’t work for FDR, didn’t work for Japan, etc). This is the Wizard-of-Oz part of Keynesianism. No matter how bad it works in the real world, they always claim that it theoretically could have worked if governments simply spent more. But how do they explain away the fact that nations that adopt the right kind of austerity get better results? Professor Edmund Phelps of Columbia University won the Nobel Prize in economics in 2006. Here’s some of what he wrote today for the Wall Street Journal, starting with a description of the debate. Generations of Keynesian economists have claimed that when a loss of “demand” causes output to fall and unemployment to rise, the economy does not revive by itself. Instead a “stimulus” to demand is necessary and sufficient to pull the economy back to an equilibrium level of activity. …it is widely thought that fiscal stimulus—increased public spending as well as tax cuts—helped pull employment from its depths in 2010 or so back to normal in 2017. …But is there evidence that stimulus was behind America’s recovery—or, for that matter, the recoveries in Germany, Switzerland, Sweden, Britain and Ireland? And is there evidence that the absence of stimulus—a tight rein on public spending known as “fiscal austerity”—is to blame for the lack of a full recovery in Portugal, Italy, France and Spain? So he looked at the real-world evidence and discovered that Keynesian policy is correlated with worse outcomes. 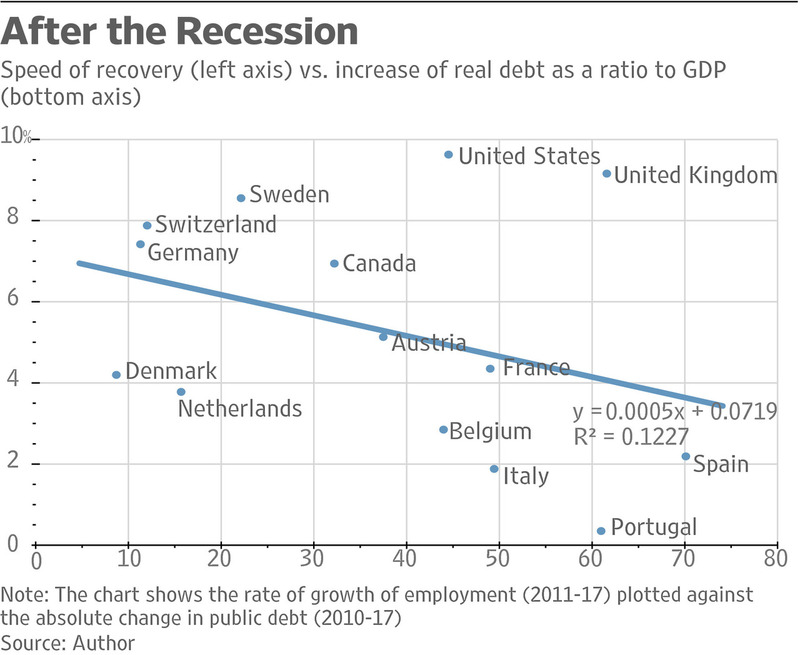 The stimulus story suggests that, in the years after they hit bottom, the countries that adopted relatively large fiscal deficits—measured by the average increase in public debt from 2011-17 as a percentage of gross domestic product—would have a relatively speedy recovery to show for it. Did they? As the accompanying chart shows, the evidence does not support the stimulus story. Big deficits did not speed up recoveries. In fact, the relationship is negative, suggesting fiscal profligacy led to contraction and fiscal responsibility would have been better. …what about monetary stimulus—increasing the supply of money or reducing the cost of money in relation to the return on capital? We can perform a similar test: Did countries where monetary stimulus in the years after they hit bottom was relatively strong—measured by the average quantity of monetary assets purchased by the central bank from 2011-17—have relatively speedy recoveries? This is a complicated question, but preliminary explorations do not give strong support to that thesis either. …the Keynesian tool kit of fiscal and monetary stimulus is more or less ineffective. Here’s the chart showing how so-called fiscal stimulus is not associated with economic recovery. He also reminds us that Keynesian predictions of post-World War II disaster were completely wrong. Don’t history and theory overwhelmingly support stimulus? Well, no. First, the history: Soldiers returning from World War II expanded the civilian labor force from 53.9 million in 1945 to 60.2 million in 1947, leading many economists to fear an unemployment crisis. Keynesians—Leon Keyserling for one—said running a peacetime fiscal deficit was needed to keep unemployment from rising. Yet as the government under President Harry S. Truman ran fiscal surpluses, the unemployment rate went down (from 3.9% in 1946 to 3.1% in 1952) and the labor-force participation rate went up (from 57.2% to 58.9%). It’s also worth remembering that something similar happened after World War I. The economy boomed after the burden of government was reduced. Let’s close by adding to our collection of Keynesian humor. 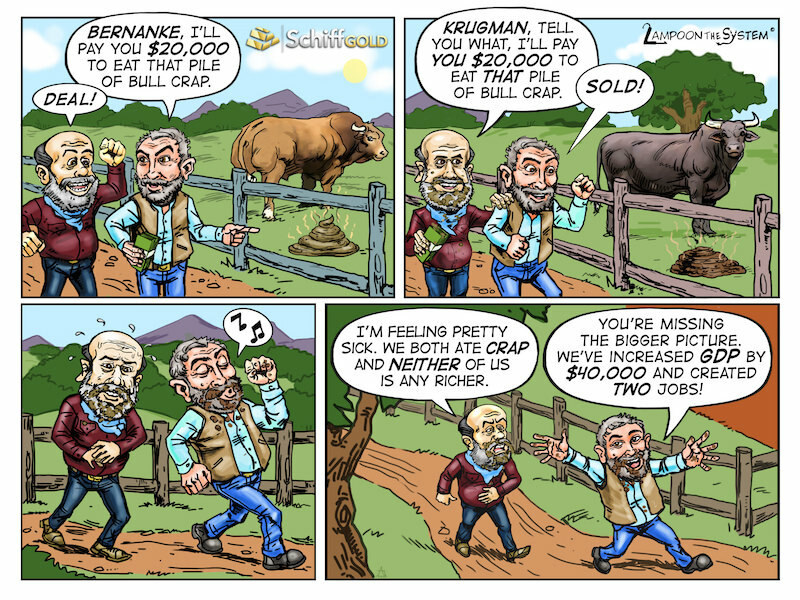 This is amusing, but somewhat unfair to Bernanke. Yes, he was a Keynesian. But he wasn’t nearly as crazy as Krugman. P.S. Here’s my video on Keynesian economics. P.P.S. Here’s the famous video showing the Keynes v. Hayek rap contest, followed by the equally entertaining sequel, which features a boxing match between Keynes and Hayek. And even though it’s not the right time of year, here’s the satirical commercial for Keynesian Christmas carols. P.P.P.S. I also like what Professor Phelps said about the benefits of tax competition and jurisdictional rivalry.